Rustic charm abounds in this home with wide plank hardwood floors, exposed wood beams prominently on display, and a tongue and groove cathedral ceiling. The open concept on the main floor feels cozy and intimate at the same time. Stainless steel appliances gleam throughout the recently renovated kitchen and there is seating for 4 at the breakfast bar. For more formal sit down meals there is a separate dining space tucked away opposite the kitchen. The living area is split between views of a gorgeous stone, wood burning fireplace and a large seating area. Downstairs there are three bedrooms along with two full bathrooms. Outside there are two decks, one through the sliding glass doors which overlooks the front of the property, and the other, off the rear of the home, looks out towards a wooded area. On the deck there is a brand new bbq that can run on gas or charcoal and a brand new patio set. If you'd like to unwind with movies or social media there is wifi. Please note a $25 late registration fee will be applied to your listing if you book within 7 days of the beginning of your stay as per HOA rules. *2 guests may sleep on a combination of air mattress/couch. Check out our website: www.corcabins.com OR www.facebook.com/CorCabinsLLC/ Our mission is to combine what has traditionally been two very different types of vacation experiences. Many people enjoy the resort experience because of the personal service and having a concierge desk to assist them with planning their day, restocking towels, obtaining directions, or providing a recommendation on which local restaurant to visit. There are also those individuals who enjoy the privacy and autonomy that only a self-catering vacation rental can provide. Our mission is to combine the best of both of these experiences. Our guests can enjoy a private accommodation in the form of a vacation rental and, if they prefer, be left to cater to themselves. However, if a guest wants more, that is where the virtual concierge service comes into play. Our virtual concierge is available 24/7 to assist guests with whatever needs they may have. Want the fridge stocked with your favorites upon arrival? Or do you prefer to have meals catered and delivered? Or would you want a personal chef for the duration of your stay? Our concierge can provide anything and everything a guest may desire. Whether it be directions to local attractions, scheduling in house spa treatments, or instructions on how to use the wi-fi, the Cor Cabins Virtual Concierge can make it happen. Our mission is simply to pamper our guests from a distance and provide an environment of peace, love, and wellness. It is a one of a kind vacation experience that allows our guests to “Get Away, to Come Home!” Visit corcabins.com for more information. The Masthope hideaway is nestled in the Masthope Mountain Community and offers a wide array of activities and amenities for guests to enjoy during their stay. This particular property is a ideally located for access to community amenities, such as Ski Big Bear and even an equestrian center. It is also within a short distance to local attractions, towns, and destinations. The cabin itself is tastefully decorated with cozy furnishings, helping to create an atmosphere of peace and wellness. 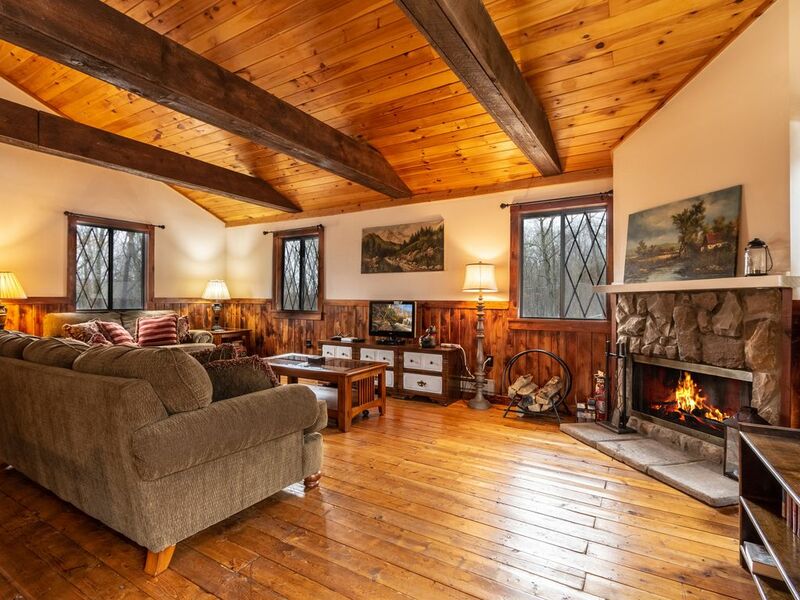 Hardwood floors gleam throughout the home, while exposed beams and a wood burning fireplace provide a rustic charm within this open concept 2 bedroom vacation rental. From towels to utensils, and firewood to linens, everything is prepared and waiting. The only thing missing is you! A Cor Cabins property distinguishes itself from the loud and cluttered vacation rental market by offering a unique and innovative virtual concierge service to our guests. Our virtual concierge allows guests to book and enjoy countless pampering services such as guided hikes, personal chef services, massage therapy, and anything else you can dream of! We pride ourselves on providing prompt, professional, and personal service that meets the needs of all types of vacationers. Whether you want the keys to the cabin and be left alone to cater to yourself during your stay, or if you want everything from soup to nuts, our Virtual Concierge Service can make it happen! Simply put, at Cor Cabins we invite you to get away, to come home! Visit corcabins.com for more information. Please bring your own detergent and supplies. Ski Big Bear passes are 25% off with a renters pass! The house was great. The beds were so comfortable and the whole house was clean. Matt was very responsive to any questions I had. The house is close to the amenities. I will definitely stay there again. Fun ski trip with family. Enjoyed our evenings at Hideaway after long days of skiing at nearby Ski Big Bear. It was so cozy and lovely! We had a great stay! So close to the lodge for skiing and tubing, and every morning the deer came to visit! It was so peaceful and I have already recommended to my friends. I would absolutely rent from Matt and Dave again. They were so helpful and informative!! It was perfect for our weekend get away with the family. So clean !!!! It was awesome our first skiing experience! Love the community everyone was so nice and helpful. Would definitely recommend to family and friends and we are going back. Very cozy and comfortable and clean did that I mention that. David was great whenever we had questions he was there either by text or phone. I really appreciated the text from David regarding instructions I thought it was very helpful. When we booking this place we were looking for a quiet getaway from our very busy lives. The house was very clean cozy and just what we were looking for. The beds were extremely comfortable! I liked that it had two bathrooms also. Nice and close to ski hill, we would go again and highly recommend it. We thoroughly enjoyed our stay at 103 Plateau Drive! It was cozy, clean and spacious! The hosts were great in providing all needed information before we arrived. We will be back! Thanks for a great getaway!